Additional katas will be added and can be bought and downloaded in-app. This is the real thing. You will be able to look up any count anywhere, just as in the traditonal kata books, view it from any angle and get on with your training. The app is made by karate-ka for karate-ka. You will find the most comprehensive, detailed and smart reference out there for your ongoing kata training. This is the shotokan karate kata reference you have been looking for! 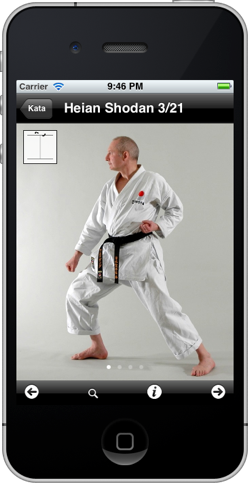 A complete reference of the first 15 katas - and more available through In-App purchase. • Each count in each kata has been carefully photographed with respect to the detail important to every karate-ka, from the beginner to the most skilled. • Any technique can be rotated, as each count in each kata has been photographed from 4 different angles (north, south, east, west). • More advanced movements are illustrated with additional pictures in landscape-mode, making the transition to the following count more understandable. • Enbusen is shown together with the count, and can be enlarged or removed. • Any count can be looked up in an instance with the thumbnail-mode. • The katas are performed by highly skilled godan and rokudan (5th and 6th dan black belt) karate-ka. • Every count is named according to the official and latest terminology, including technique and stance. This App is not intended for people not attending a karate-dojo; you will not find any instructions in the app on how to learn karate. With future updates this app will go with you all the way to Gojushiho Dai. Kata Atlas is available in a free lite edition which contains a reduced set of katas. The lite edition is a great way for you to explore the features of Kata Atlas before you buy the full edition. Download the free lite edition here.